Jack Cavanaugh Jr. and Sr. on their back deck: With his dad’s help, young Jack is on the mend. THE CAVANAUGHS have raised their son twice. They taught him to speak, twice. They taught him to walk, twice. Jack Sr. even taught Jack Jr. to ride a bicycle, twice. Jack Cavanaugh Jr. was 21 in August 2013 when he fell 12 feet from an indoor balcony at his parents' cabin in the Poconos. The fall caused a traumatic brain injury that left him comatose for a month. When he awoke, he couldn't walk, communicate, or swallow. His body was a strange machine he couldn't control. Cavanaugh had played soccer and run track at Cardinal O'Hara High School in Springfield, Delaware County. After months of therapy, on Father's Day two years ago he was able to add surfing to his athletic resume. Using a specially designed "sand wheelchair" and a specially adapted surfboard, he surfed in the waters off the Jersey Shore at an annual event for people with disabilities. "The initial feeling when I first got in the water was . . . 'I'm home,' " he said. By Father's Day last year, he was walking into the water himself. 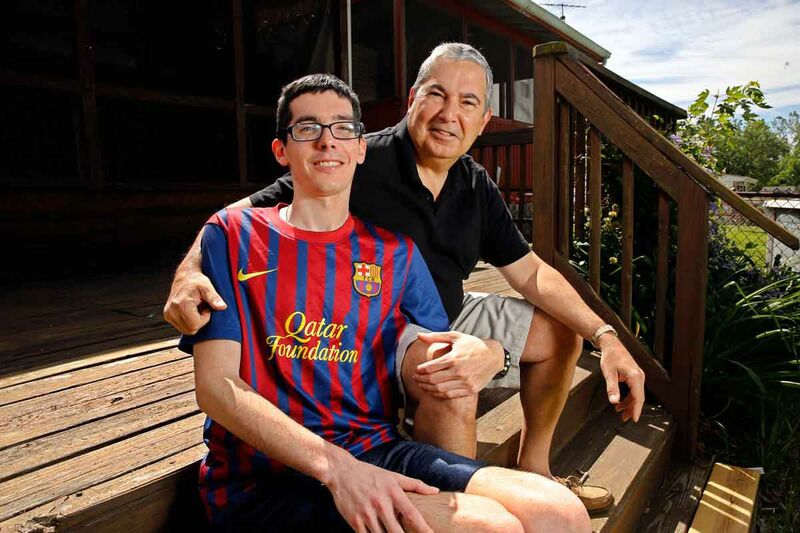 He vowed to return in 2016 - not as a participant, but as a volunteer, alongside his dad. And that's how the father and son from Woodlyn, Delaware County, intend to spend this Father's Day: volunteering together, helping others who are where Cavanaugh was just three years ago. "It's kind of like the greatest Father's Day gift," Jack Sr. said. "To see his progress is the gift." Cavanaugh, now 24, is tall and lanky with jet-black hair and thick-rimmed glasses. He speaks slowly and methodically as a result of his accident, but his vocabulary is large, his wit sharp. He remembers nothing of the fall that caused his brain injury, but his parents will never forget the call from his friend that their son had been taken to the hospital. They'll never forget driving overnight in the rain from their home and searching hospitals until they found their son at Geisinger Wyoming Valley Medical Center in Wilkes-Barre. "A neurologist came up to us and said he'd suffered a severe brain injury," Jack Sr. said. " At one point, the doctor did ask me if he was an organ donor." Cavanaugh remained in Geisinger for a month, in an induced coma. "We were there every day," his father said. In September 2013, he was transferred semiconscious to MossRehab's Drucker Brain Injury Center in Elkins Park. His first fear was that he had lost his mind, not that he'd damaged it. "I knew I was at a hospital and the few people on my floor had brain injuries and they would yell, so I thought I was in a mental hospital," he said. Over the next three months, Cavanaugh went through intensive inpatient physical, speech, and occupational therapy. "For me, that was the toughest part because I had to see him struggle," said his father, an accountant. "It was one thing when he was at Geisinger just lying there, because it was almost like he was sleeping . . . but it was another thing to see him struggle." Cavanaugh's mother, Anne, a bookkeeper, had a different reaction. "I couldn't leave Moss because I wanted to learn everything," she said. "I looked at it like, 'We are going to rebuild you like we did when you were a baby. I'm going to watch you grow again and I'm going to be there to help you every ounce of the way.' "
Cavanaugh can't remember his accident, but he remembers the names of every nurse from MossRehab and even the name of the center's therapy dog, Seamus. He remembers every date that mattered in his recovery – including the day he finally went home, Nov. 23, 2013. "All during this time, people were amazed at the progress he was making," his father said. Following his release, Cavanaugh, still in a wheelchair, continued outpatient therapy. Kimberly Miczak, a physical therapist at MossRehab, said his motivation and his parents' dedication were keys to his recovery. "One of the reasons we think Jack made such a good recovery is because his parents were so involved," Miczak said. "They had to learn how to help him and when to challenge him." Anne bought books for every grade level and retaught her son to subtract, multiply, and spell. Meanwhile, Jack Sr. retaught his son to ride a bicycle, swing a golf club, and shave. "You felt like you went through his life again, but in a sped-up version," Anne said. It has given Cavanaugh a unique appreciation for his mom and dad. "I had to learn, essentially, the hard way that I do need help from my parents," he said. "I can't go out and conquer all the things I want to do on my own." Today, Cavanaugh is a Dean's List student at Delaware County Community College. He plans to attend West Chester University in the spring. Last week, he reached one of his "big goals" when he ran three miles. On Sunday, he'll reach another when he volunteers at the 10th annual They Will Surf Again event in Wildwood Crest, Cape May County. He and his dad will be among more than 300 volunteers helping about 60 people with brain or spinal-cord injuries surf at the event hosted by Life Rolls On, a nationwide nonprofit organization. Cavanaugh had pledged to return as a volunteer this year because he was moved by a disabled boy of no more than 8 at last year's event. "They wheeled him down and they put him on a surfboard and he just raised his hands up. He was so happy he could go on a surfboard - he didn't even ride a wave or anything," Cavanaugh said of the child. "Just to see that - his smile was from cheek to cheek - I'm sorry; you have to have a heart of stone not to be moved by that." Miczak said Cavanaugh's pledge to volunteer was poignant. "I think it's so inspiring that his point of recovery has gotten to a place where he feels confident enough to help other people," she said. The one thing Cavanaugh didn't lose in the accident was his sense of humor. When asked what volunteer position he would work, he smiled and shrugged. "Truthfully, I don't know what the hell they're going to do with me," he said. "Two years ago I could barely walk and now I'll be looking out for another disabled life in the water!" "Maybe we'll have you help with registration," he said.